Mitosis and genome segregation in eukaryotes are surprisingly dependent on nuclear pore complex proteins (‘Nups’) plus actin and other components of the nucleoskeleton. 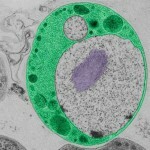 This suggests nuclear structure and mitosis might have co-evolved in early eukaryotes. Fundamentally new insight about mitosis is also coming from bacteria, in which DNA segregation is mediated by proteins related to actin or other conserved nucleo-cytoskeletal proteins, and membrane-associated proteins. 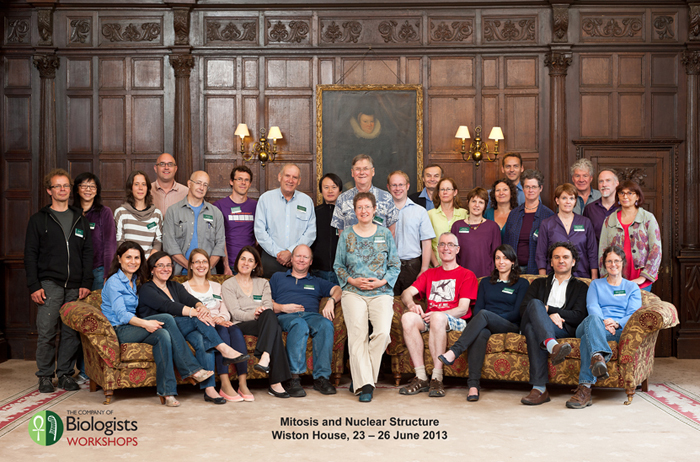 This high-level workshop will bring together scientists who normally inhabit separate ‘worlds’— evolution, bacterial cell biology, eukaryotic mitosis, chromosome biology, and nuclear structure— for intensive discussions in the setting of a beautiful English estate to gain fresh insight, stimulate new ideas and forge innovative collaborations essential to understanding the conserved origins of life on earth. Nuclear proteins reorganize during mitosis to form a spindle matrix (red; Skeletor) that contributes to the formation and function of the microtubule spindle (green; tubulin). Image provided by Kristen Johansen and Jorgen Johansen. TEM image of Gemmata obscuriglobus, a member of the Planctomycetes bacterial phylum. DNA is colored purple and the vesicle-containing compartment (‘cytoplasm’) is colored green. The DNA-containing compartment is bordered by one bend membrane. Image provided by Damien Devos. 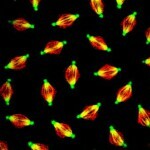 Two images of mitotic cells expressing CFP-histone and GFP-Sec61b to label ER. The cell on the right has been depleted of a putative NE membrane-MT linker protein (REEP3/4) and the membrane associates aberrantly with the chromatin. Image provided by Rebecca Heald. Meeting report written by John C. Meadows, Katja Graumann, Melpi Platani, Nina Schweizer, Takeshi Shimi, Paola Vagnarelli, Jay C. Gatlin and published in the Journal of Cell Science. 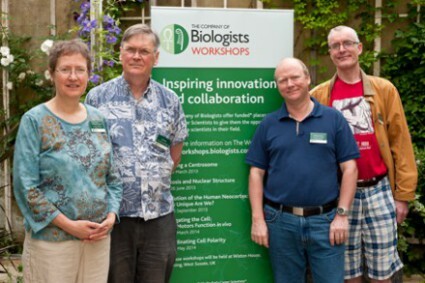 JCS Reviews Editor Petra Gross interviews Katherine Wilson, Sir Tim Hunt and Ralph Gräf at the Workshop.